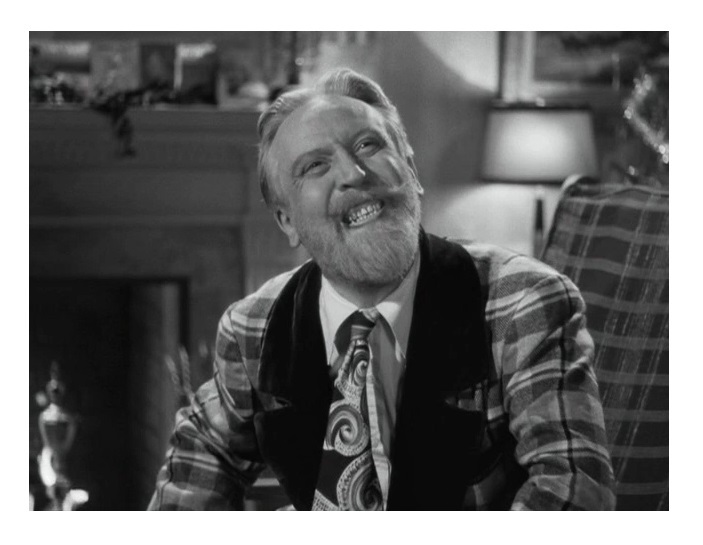 Mercurial radio personality, Sheridan Whiteside (Monty Woolley, The Pied Piper and Since You Went Away), falls and breaks his leg in front of a fan’s house and remains confined in the home while recovering. Whiteside proceeds to drive everyone crazy with his over the top demands. The famous 1939 stage play — written by George S. Kaufman and Moss Hart — makes a fine transition to the silver screen. Thanks to the solid material and great bits of business by a perfect cast, The Man Who Came to Dinner is a total delight from beginning to end — it has, understandably, become a beloved classic! Directed by William Keighley (The Bride Came C.O.D.) from a screenplay by the Epstein brothers, The Man Who Came to Dinner does have flaws. The film has a bit of “canned theater vibe” that I found a little grating, and it’s much too talky. Keighley’s unimaginative direction is a problem — I feel his style was better suited for dramas and action flicks — but the characters are fun and the situations are filled with plenty of laughs. 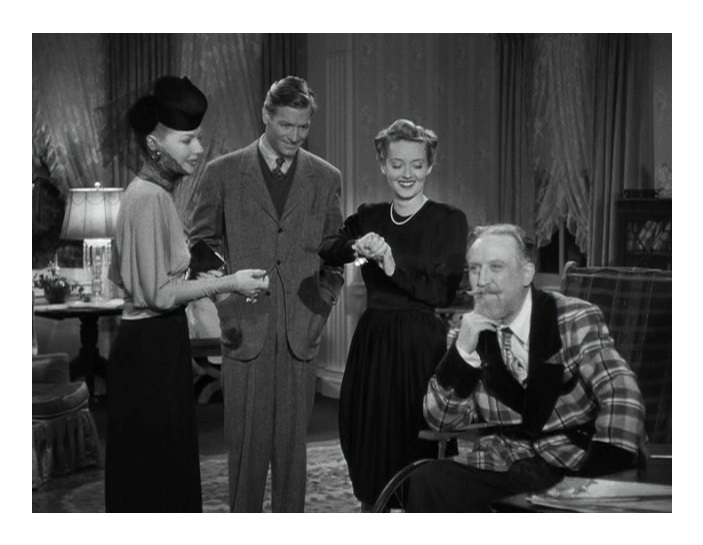 Bette Davis plays Whiteside’s secretary, Maggie Cutler, and she looks perfectly comfortable in a comedic setting for a change. I think the reason Davis is so relaxed is because she’s not working for laughs — she is playing the most normal character in a story filled with lunacy and madcap mayhem. It’s supporting role, but she’s delightful — the role of the secretary was specifically (re)written for her. In her autobiography, The Lonely Life, Davis claimed that she convinced Warner Bros. to buy the property as a possible vehicle for her and John Barrymore (Grand Hotel and Dinner at Eight), but there is ample evidence that the studio initially approached Orson Welles (Citizen Kane and Touch of Evil) to star and direct the movie. Welles’s exclusive contract with RKO prevented him from accepting the job. Barrymore was tested, but alcohol had destroyed his memory. Charles Laughton (Mutiny on the Bounty), Charles Coburn (The More The Merrier) and Cary Grant (The Philadelphia Story) were considered as replacements. 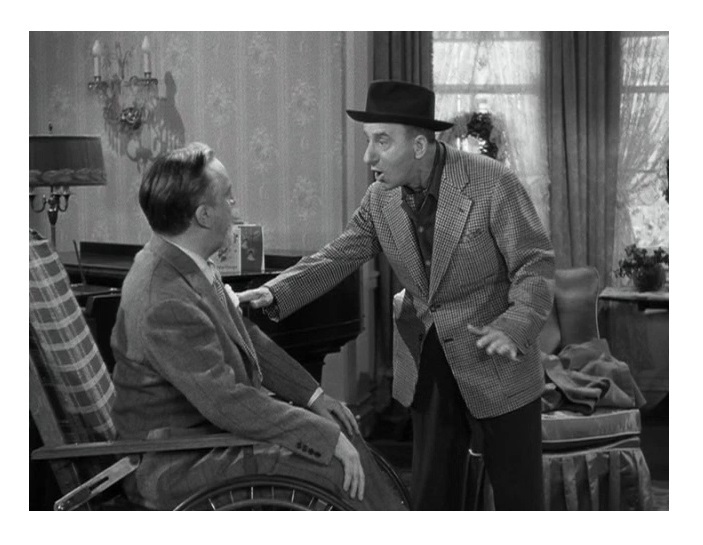 The studio settled on Woolley, who originated the part on Broadway, and he is indeed perfect as the acerbic Whiteside. Davis always said that she was okay playing second fiddle to Woolley’s Whiteside, but I’m kind of surprised that she didn’t grab the part of the vain actress, played by Anne Sheridan (Angels with Dirty Faces). It’s a showy role that Sheridan plays to perfection — she nearly steals the film with her hilarious characterization (supposedly based on theater legend Gertrude Lawrence). The “Oomph Girl” demonstrates that she, perhaps, was born to play comedies, not heavy dramas. The rest of the wonderful cast includes Billie Burke (Father of the Bride) as Mrs. Stanley, Reginald Gardiner (The Great Dictator) as Beverly Carlton (a parody of Noel Coward), Mary Wickes (Sister Act) as Nurse Preen, Grant Mitchell (Laura) as Mr. Stanley, and Jimmy Durante (Billy Rose’s Jumbo) as Banjo (a thinly disguised spoof of Harpo Marx). Gig Young (Old Acquaintance) has a bit part. 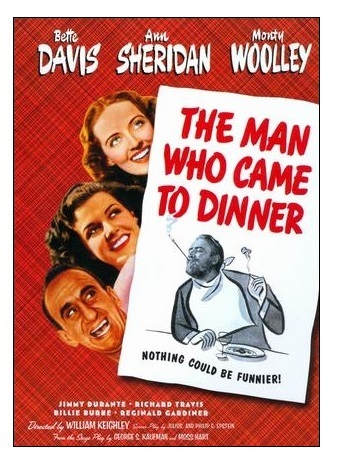 The Man Who Came to Dinner takes place around Christmastime so if you need a break from It’s a Wonderful Life, this is a perfect movie to watch during the holidays. The play has been adapted numerous times. B&W, 112 minutes, Not Rated. This really needs to be seen around Christmas (I watched it again last December) for best effect, but it’s a terrific movie at any time of year. Witty and classy all the way through. This is one of my wife’s favorite Xmas movies! We watch it every year!